The new year is just a few days old and I feel so bored of the grey sky. My desire for colours as sweet as candy is very strong and one particular is on my mind the whole time: Lilac. This colour is full of romance, tenderness and grace. Lilac is a little bit similar to light pink, just cooler and less girly. It's said that lilac is very unique and special, but without the deeper mystery of purple. Imagine yourself wearing the outfit from above, all dressed in this truly feminine colour with glitter and roses: You would look like you just stepped out of a wonderful dream. I choose a coat and cardigan, because the weather is not warm yet, but nevertheless the outfit is promising springtime tea time parties to come soon. Lilac is my personal springtime favourite this year and I hope there will be a lot of beautiful things in this colour to be found to brighten up the wardrobe. I already told you that metallic colours will be very trendy in spring and lilac is a perfect match for them. It goes well with silver, gold, metallic pink or green. 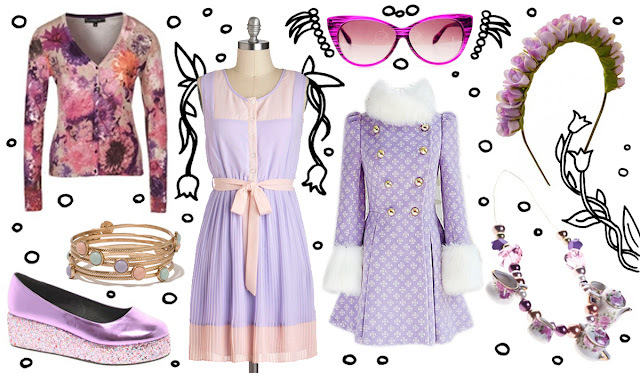 What do you think about lilac and the pieces above, do they make you dream of a garden full of hydrangeas? Wonderful colour, inspiration, and YOU!!! Superschöne Sachen hast du ausgesucht! Der Mantel ist ein Traum! Und der Haarreif - genial!